Detailed petrography and microfacies analysis of the studied rock units in Abu Roash area revealed the presence of twenty-two microfacies representing the different recognized clastic and non-clastic rocks. These microfacies are almost of carbonate types except few ones are of clastic types forming the basal part of Abu Roash Formation (basal clastic member) and comprise only four types. On the other hand the carbonate microfacies are differentiated into fifteen limestone and two dolostone microfacies. One chert microfacies is also recognized representing the chert bands and lenses that observed in several members of Abu Roash Formation. 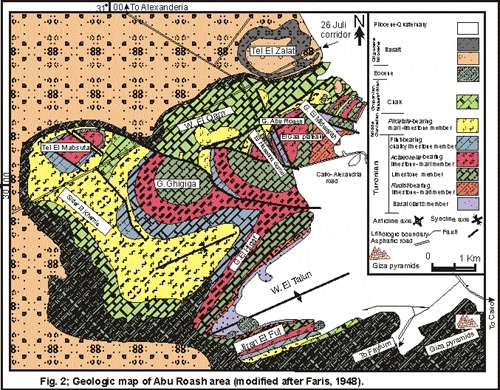 Detailed facies analysis of the different rocks constituting Abu Roash rock succession leads to discriminate nineteen sedimentary facies assigned from A to N that are predicated to their appropriated depositional environments. These are characterized by variable conditions and settings ranging from lower mixed to upper intertidal flat and subtidal channel for the clastic facies and calm to agitated open marine inner to middle platform for the carbonate facies. Vertical sequence or facies hierarchy of the obtained sedimentary facies is recognized to elucidate the depositional model of each member. The facies sequence of the basal clastic member indicates a progradational preitidal sequence. While those of the rudist-bearing member and limestone member represent a cyclic progradtion of high energetic/storm facies above an open marine low energetic fore shoal subtidal facies. The facies sequence of the Actaeonella-bearing member reflects two facies associations comprising open marine subtidal assemblage and shoal or bank facies. The latter facies represents the bank that the robust thick shelled Durania arnaudi with the coralline sponge heads accreted local mounds in restricted areas (El-Hassana dome). The vertical facies hierarchy of the flint-bearing chalky limestone member suggests a renewed shoaling of the depositional accommodation, shifting to inner-platform setting and a progradation of mobile bioclastic shoals or banks. The stacking of the sedimentary facies in the Plicatula-bearing member indicates an accumulation in an open shallow sea (inner platform) with intermittent supply of fine terrigenous clastics and clays. Submission Details: Thesis Abstract submitted by Hanan Sayed Mohamed Badawy from Egypt on 14-Feb-2009 23:02. Abstract has been viewed 3725 times (since 7 Mar 2010). Great care has been taken to ensure that this information is correct, however ThesisAbstracts.com cannot accept responsibility for the contents of this Thesis abstract titled "Stratigraphy and Facies Analysis of the Upper Cretaceous Abu Roash Formation in Abu Roash Area, Giza, Egypt". This abstract has been submitted by Hanan Sayed Mohamed Badawy on 14-Feb-2009 23:02. You may report a problem using the contact form.